Jie Huang, who is is an Associate Professor of Law and Associate Dean at Shanghai University of International Business and Economics School of Law and Director of China Association of Private International Law, has published Interregional Recognition and Enforcement of Civil and Commercial Judgments – Lessons for China from US and EU Law (Hart publishing). 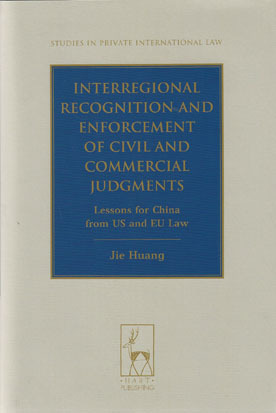 Judgment recognition and enforcement (JRE) between the US states, between EU Member States, and between mainland China, Hong Kong and Macao, are all forms of ‘interregional JRE’. This extensive comparative study of the three most important JRE regimes focuses on what lessons China can draw from the US and the EU in developing a multilateral JRE arrangement for mainland China, Hong Kong and Macao. Mainland China, Hong Kong and Macao share economic, geographical, cultural, and historical proximity to one another. The policy of ‘One Country, Two Systems’ also provides a quasi-constitutional regime for the three regions. However, there is no multilateral JRE scheme among them, as there is in the US and the EU; and it is harder to recognise and enforce sister-region judgments in China than in the US and the EU. The book analyses the status quo of JRE in China and explores its insufficiencies; it proposes a multilateral JRE arrangement for Chinese regions to alleviate current JRE difficulties; and it also provides solutions for the macro and micro challenges of establishing a multilateral arrangement, drawing upon the rich literature on JRE regimes found in the US and the EU.